The decade of the 1960's was an exciting and fast-moving time for electronics, being that it was the beginning of a major paradigm change from vacuum tubes to transistors, from discrete circuit components to integrated circuits, and from point-to-point wiring to printed circuit boards. Computers were on the verge of moving out of university labs and corporate research and development centers to small businesses and retail headquarters. Electronic calculators were replacing mechanical calculators. Digital systems were replacing analog systems. 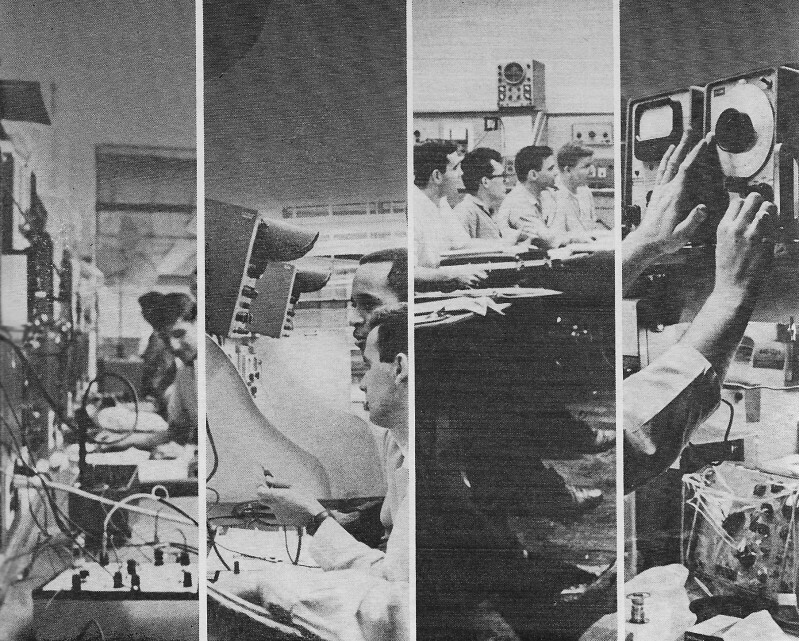 Electronics training schools were in their collective heyday. Training prospects lined up in droves and competed to gain acceptance into the institutes. Home-study courses provided theory and hands-on building and troubleshooting experience with working televisions, radios, and test equipment. Popular Electronics magazine published many articles on the subject that included extensive resources for making a decision based on personal finances and opportunity. In Whippany, New Jersey, Richard J. Ewalt carefully checks out a complex piece of computer test gear he helped design. The equipment will become part of the Nike-Zeus anti-missile system developed by Bell Laboratories, Ewalt's company. In Edwards, California, Loren E. Hirman sets up a series of subcarrier oscillators in a telemetry system. The device is used to transmit data from planes being tested by Hirman's company, General Dynamics. In Albuquerque, New Mexico, Harry F. Chaney shoves a batch of tubes on a special test board into an oven, checks their performance at different heat levels to see how they'll operate under extreme temperatures. He works for the Electron Tube and Semiconductor Devices Division of Sandia Corporation, a leading company in atomic energy development. All three of these men - Ewalt, Hirman, and Chaney - are electronics technicians, vital members of today's electronics team. For men - and women - interested in electronics, it's a good team to join. The industry is advancing rapidly; new people are needed badly. Pay is good, working conditions usually top rate, and jobs are almost universally interesting. But there's a catch. If you're untrained, don't bother to apply. A few decades ago, a bright young man could pick up enough know-how working around the local radio repair shop to qualify for a job chasing electrons. Or he could work in a plant and with a little study on the side eventually learn enough to get promoted to an electronics job. But no more. Today, you've got to know what you're doing. That means a good technical school education. The first thing to decide is where you want to fit into the electronics picture. In general, today's technical school programs are designed on three different levels. "Just how far you're able to get depends on ... how hard you're willing to work." Engineering Technology. To become an engineering technician, you'll spend two to three years at one of the top technical institutes, a junior college, or a division of a regular four-year college that provides an engineering technology program. In most cases, you'll end up with an A. S. (Associate in Science), an A. S. E. E. (Associate in Science, Electrical Engineering), an A. A. S. (Associate in Applied Science), or some similar degree. The course will cover virtually the same areas in math, the sciences, and engineering that regular electronics engineers study. And as with engineers, you'll spend most of your time - 60 to 80 percent of it - in class. Lab courses account for the other 20 to 40 percent. Toward the end of your training, you'll have the opportunity to specialize. At New York's RCA Institutes, for example, you can become an expert in communications or computers. At Capitol Institute of Technology in Washington, D. C., you might choose communications engineering, nuclear instrumentation, or control systems as your field of concentration. The engineering technician's program, while at college level, is designed for the man who wants to work with hardware. "It depends on what he wants to do after graduation," says Edward Norman, Capitol's Dean. "Does he want to hold down a desk and let paper be the prime result of his effort? Then he'd probably be happier as an engineer. But if he wants the more practical type of employment where he can actually get his hands on a few parts now and then, he'd probably like being an engineering technician better." "There is heavy emphasis on math and physics in an engineering technology course," adds Mike Terzian, Dean of Administration at RCA Institutes. "Since it's a college level course, a student can get credit for most of the work he does if he should later decide to go to college for an engineering degree. "Meanwhile, after a little over two years, the man who finishes our T-3 course [RCA's program at the engineering technology level] is ready to go to work. The majority of our graduates get jobs in research and development. A project engineer will design something - say a piece of data processing equipment which is supposed to meet certain specifications. Now it's up to the engineering technician to build the prototype from scratch. He punches out the chassis, lays out the circuit, builds it and tests it to see if it meets specifications. If not, he may recommend modifications." "Engineering technicians also do other types of jobs," says Richard Ungrodt, Dean of Engineering of the Milwaukee School of Engineering. "They might be part of a team that works out production techniques. And some of them work in sales and maintenance. You'll frequently find engineering technicians assigned to computers, for example. In the old days, you'd find an engineer doing this job, and sometimes you still do. But a lot of this work can be done by top-level engineering technicians. So they're really doing engineering level work." "This program is designed for the fellow who wants to do service type work," says C. L. Foster, president of Central Technical Institute of Kansas City, Missouri. "He may maintain two-way radios in a fleet of trucks, or enter the broadcast field. Or he may work for the same company as the engineering technician, doing work on a less complex level." "There's not so much math in his curriculum," says RCA's Terzian, "and there's more lab work. His training is aimed toward analysis and troubleshooting, rather than design. It's a good course for the guy who doesn't have college in the back of his mind, and there's a steady demand for people with this training." A man preparing for an industrial technician's job may spend a year to a year and a half in school. He'll get a diploma or certificate when he finishes, but if he ever decides to go to college, he'll have to start at the beginning; his credits won't be transferable. A service technician may work in a service shop, trouble-shooting radio and TV sets and hi-fi gear. In industry, he might do routine production testing or writing on a production line. But because his skills aren't up to those of the engineering or industrial technician, he's not able to compete for jobs as well as his more highly trained colleagues. "As the demands of industry have increased in the last ten or fifteen years," says Mike Terzian, "technicians have needed more training. The man with only a service technician's background isn't likely to .be able to hold down more than a routine job. And demand isn't too strong; sometimes we have trouble placing them." "The only place we offer a radio and television servicing course per se is in our night school," says J. J. Gershon, Dean of Chicago's DeVry Technical Institute. "We feel that competition being what it is, our graduates need more than just a background in radio and TV." The electronics technician field is open to women. 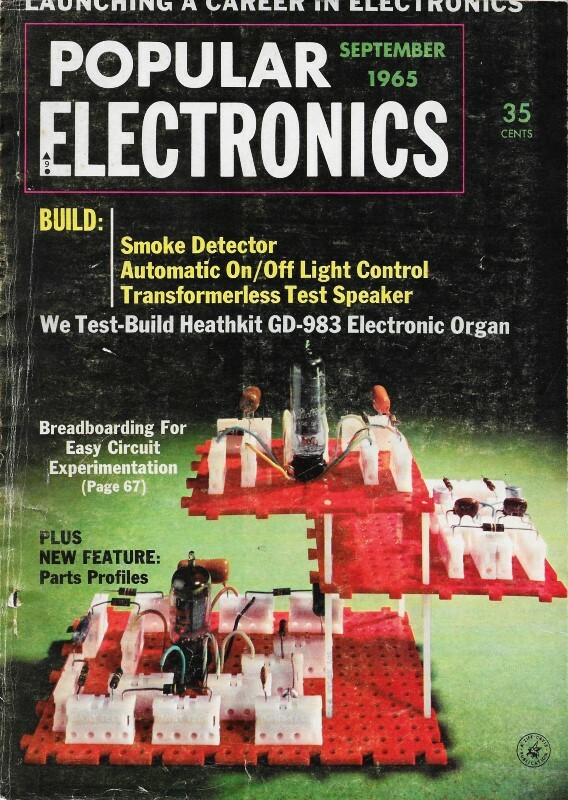 Of course, it's one way to get started in electronics. If you can't afford to take a longer course, you might become a service technician, then go on with further schooling on a part-time basis after you get a job. Generally, a service technician's training takes 6 to 12 months of full-time schooling, up to two-and-a-half years in night school. Can I Prepare for a Technician's Job Through Home Study? The answer to this controversial question depends on whom you ask. Generally, most schools agree that you can't reach the engineering technician's level or get an associate degree through the mail. "There's no comparison between resident and home study training," says DeVry's Gershon. "Resident training is certainly more desirable. But if a man has a family or can't leave a certain area, then he has no choice. He can profit from home study, even though he can't attain the same level that he could in resident school." "Home study is more oriented toward radio-TV servicing and manufacturing - assembly line work - than residence schools," says Harry Rice, Dean of RCA Institutes home study division. "But home study graduates also get jobs as broadcast engineers and technicians in industry, and they open their own businesses." A somewhat different view is taken by one official who asked that his name not be used. "I don't recommend correspondence training to any young man who is seriously interested in a career in electronics," he says flatly. "If he's lucky, he might get a job on a production line doing routine wiring or testing. But it would be very difficult for him to get a real technician's job." Some schools take another view. "The main difference between residence and correspondence schools is that in residence school you learn the material in a much shorter time," says Norman of Capitol Institute. "And, of course, the lab work can't be the same." Capitol Radio, a home study school formerly affiliated with Capitol Institute, requires that a home-study student be actively working in the electronics industry. Therefore, the reasoning goes, he doesn't need the same laboratory work as students fresh out of high school. But this is a unique requirement on the part of Capitol Radio. Foster of Central Tech also claims advanced standing for his home-study curriculum. "Our home study program very closely approaches the engineering technician's program," he says. "We can't say it's absolutely equivalent, because we do not go into higher math and practical laboratory work is limited. But. a home-study graduate is certainly prepared for a job at the industrial technician's level." If you're trained as an electronics technician, job finding won't be a problem. The Technical Institute Division of the American Society for Engineering Education estimates that some 16,000 engineering technicians are graduated each year. But the Bureau of Labor Statistics of the U. S. Department of Labor places the demand at about 80,000 a year. That means more than five jobs available for each man trained. "The engineering technician's program ... is designed far the man who wants to work with hardware." Milwaukee School of Engineering says it could easily place twice as many graduates if it had them. RCA reports that 90 percent of its industrial and engineering technicians have jobs lined up even before they graduate. The other ten percent aren't looking for jobs; they're foreign students returning home, young men going into the service, and so on. Other top schools report a similar situation. By the way, the door is open for girls. "They can work in electronics as well as men," says Terzian. "And in most places they have no trouble getting a job." "If you're trained ... finding a job won't be a problem." Starting salaries vary, of course, in different parts of the country, at different companies, and for technicians with varying amounts of training. Generally, though, an engineering technician might start in the vicinity of $500 a month. Some, of course, don't make that much; others make more. An industrial technician might earn $50 or $75 less to start with; a service technician could average about $325 a month. There's almost no limit to how far you can advance, and most technical graduates tend to do well. DeVry made a survey recently of 43 graduates picked at random. They had graduated from two to fifteen years earlier. About 35% were in military service or just out, or were in the process of attending other schools, or just didn't answer. Of the remainder of these 43 graduates, two had become vice presidents of companies, three held the title of chief engineer, one was a principal engineer (assigned to handle projects other engineers couldn't), six were engineers, and one was working toward his master's degree. Other titles: one senior design engineer, one supervisory engineer, one district engineering sales manager, one international marketing manager, one field service administrator, four engineering assistants, two technical staff assistants, and one senior technical writer. Sometimes technical school graduates even reach top management positions, Cyril J. Statt, who graduated from Central Technical Institute in 1940, is now manager of manufacturing at General Electric's computer plant in Phoenix, Arizona. And Richard Wainwright, a 1954 graduate of Capitol Institute of Technology, is president of his own company, I-TEL, Inc., of Wheaton, Md, which designs and manufactures microwave filters. Just how far you're able to get depends on your ability, your training, and how hard you're willing to work. What Does It Take to Qualify for a Technical School? While schools vary somewhat in their admission requirements, most of them that will train you to be a high-level engineering technician accept only high school graduates with at least a C average. They usually also require one or two years of algebra, one of geometry, and one of physics or chemistry. Requirements do vary, though. Milwaukee wants a background with four years of high school math through trigonometry; others have their own additional requirements. It's a good idea to check with schools you're interested in while you're still in high school, so your courses can be tailored to meet the requirements. If that's not practical, then get all the math and science you can. But don't neglect English, either. Most schools emphasize technical report writing. Many schools give entrance examinations. If you're not up to the minimum level in any subject, you may be required to take remedial courses before you can enroll in the regular technician's program. If you enter industrial or service technician's training, some or all of these requirements may be waived. Check with the schools you're considering for entrance requirements at the various levels. Incidentally, most physical handicaps won't stop you in electronics. One that will keep you out of some jobs: color blindness. Many technicians must be able to read the color codes on resistors and other parts. And don't think you have to be fresh out of high school to qualify. Many schools have older students who worked for a while before deciding what to do. 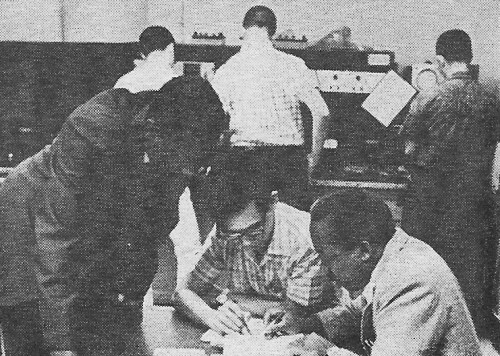 RCA had one graduate in 1960 who had been a locomotive engineer for 20 years when he quit his job to become a technician. He has recently been promoted by his company to the job of master technician, and was invited this year to read a technical paper describing some of his work at a conference of military electronics experts. Generally, tuition for an engineering technology course, lasting two to three years, will cost anywhere from a little under $2000 to almost $3000. You can pay as you go along, by the week ($20-$25) or by the month or semester. Two-year courses, naturally, tend to cost less than three-year programs. Living expenses vary considerably, depending on the city. RCA Institutes, for example, estimates that it costs students $30 to $50 a week to live in New York. Central in Kansas City, on the other hand, says that students get along for $25 a week. All schools will help you find a place to room and board; some have school dormitories. Incidentally, the tuition at a given school is generally the same, no matter what level training you're taking. The difference comes in length; you'll spend six months in some of the simpler service technician's courses, three years in the more rigorous engineering technology programs. If the total cost of going to school and living in a city away from home is too much for your budget, you might be able to work part time. "At least 75 percent of our full-time students work," says Foster of Central. National Directory of Schools and Vocations. Miller & Brown, State School Publications, N. Springfield, Pa. One of the most complete lists of technical schools. List of Accredited Curricula Leading to First Degrees in Engineering Technology in the United States. Engineers' Council for Professional Development, 345 E. 47 St., New York, N.Y. 10017. 25 cents. Characteristics of Excellence in Engineering Technology Education. Professor W. Leighton Collins, Executive Secretary, American Society for Engineering Education, University of Illinois, Urbana, Ill. 61801. 25 cents. The Engineering Technician. Secretary, American Society for Engineering Education, University of Illinois, Urbana, Ill. 25 cents. Your Opportunities in Industry As a Technician. National Association of Manufacturers, 2 E. 48 St., New York 17. N.Y. Free. How To Choose Your Technical Institute, by Hartung. Bellman Publishing Co., Cambridge 38, Mass. $1.00. Directory of Approved Technical Institute Courses. Free. Admission Requirements for Approved Technical Institute Programs of Higher Education. A review of the high school background best suited for success in technical institute programs. 5 cents. Code of Minimum Standards. This code sets forth the requirements of the NCTS for approval of Technical Institutes. 3 cents. The Electronic Technician. Electronics has become a major field of employment with electronic technicians in great demand. This monograph details the work of these technicians and the industry which employs them. 5 cents. The Engineering Technician: His Education, Entrance Into Industry. and Place on the Engineering Team. 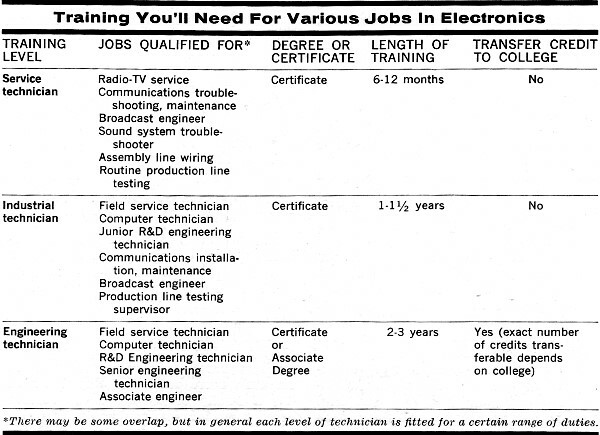 A set of charts placing the technical institute program and the engineering technician in proper relations. 5 cents. The Technician and the Engineer. Reprint of an address by Dean C. J. Freund, University of Detroit. 3 cents. The Technical Institute: Its Relation to Engineering Education and Trade Training. Reprint of an address by the late Dean C. W. Beese of Purdue University. 9 cents. "If a student wants to work," adds Gershon of DeVry, "we'll help him find a part-time job. A student who works can usually earn enough to pay for either his tuition or his living expenses, but not both. On a normal day, he'll spend two hours in lab, four hours in class, and have two or three hours of homework. That's eight or nine hours on weekdays, and then we load him up with homework for the weekend. So anyone who wants to work in addition to this heavy load is going to be a busy fellow." Terzian of RCA agrees. "It's very difficult to work and complete the T-3 program. But some students do it." Ungrodt of Milwaukee is more pessimistic. "It's really practical only if a student is willing to take more than two years to get through a two-year course. If a student works half time - 20 hours a week - and is a very good student, he might be able to carry a 14-credit load instead of the usual 18-20 quarter hour credits. But he shouldn't plan to do it on a regular basis." If you do have to work, though, most schools have facilities for helping you find a part-time job that will interfere least with your studies. How about holding down costs by starting your training through the mail, then finishing up in residence? You'll have to check with the individual school here. Central has a regular program designed to let you learn as much as possible at home, some others will work out such a schedule on an individual basis, others discourage it. But if the school you want to attend does offer such a plan, you can cut down the total cost of your technician's training by taking advantage of it. How do I choose a technical school? It isn't easy. There are hundreds of schools across the country that teach electronics; some are excellent, others barely passable. And it's not always easy to tell which is which. If you must stay at home, and if your town has only one school, then you have no problem. You'll take whatever is available, and hope it's a good school. But if you can pick and choose, here are some guidelines. First, if you're still in high school, go to the guidance department. Chances are they'll have detailed information about many schools both in your neighborhood and farther away. Second, if you're going to take an engineering technology course, find out whether the curriculum at the school you're considering is accredited, either nationally or regionally. Ask local educators - school or college officials - about regional accreditation. For national listings, see the Where To Write For More Information section of this article. Lack of accreditation doesn't necessarily mean it's not a good school, but you'll want to check more carefully if the school isn't an accredited one. Third, write the schools you're considering and ask for their catalogs. Compare the courses listed. You'll find that some schools offer a far broader program and courses on a much higher level - calculus, digital circuits, microwaves, telemetering and servomechanisms, for example - than others. Even among accredited schools, some obviously give far more than others. Incidentally, you'll generally find that those with broader courses take longer - and, of course, cost more. Finally, check the faculty listing. Faculty members of top-rated schools have impressive qualifications, both in academic degrees and experience. Have I Got What It Takes for Technical Training? Norman of Capitol Institute of Technology: "Good math background or aptitude. Inclination toward practical work. And a great deal of motivation." R. E. Baird of the Oregon Technical Institute: "While in school, he will work. If he doesn't understand, he will let you know in no uncertain terms, and will hound you until he does understand. He really wants to learn." Terzian of RCA Institutes: "First, a sincere interest in the field. Second, self discipline; the ability to sit down and do the assignments, prepare the reports, do the homework. He doesn't have to be exceptionally brilliant, but it helps if he enjoys math and physics and is good at them." Gershon of DeVry Technical Institute: "Perseverance and desire are more important than high academic ability. I'd rather give the poorer student who wants to work a lot of help to bring him up to the proper level than have the gifted one who won't work or just isn't interested." Foster of Central Technical Institute: "We look for a man who is primarily interested in technical rather than research type employment. He'll have to like to work with his hands." Ungrodt of Milwaukee School of Engineering: "Ability to work and interest in the subject matter. He should be a good math and science student. But the ability to work is the most important thing. A man who wants to get something can really work. And he has something when he's through." What he has, of course, is the key to a career in electronics. Do you have the qualifications? If so, pick out a good school and prepare yourself for a lifetime of employment in one of the most exciting fields on earth.